The Allied offensives in the Somme valley, more popularly known as the battle of the Somme, were a series of attacks carried out by the British and French armies between July and November 1916. It was one part of the overall Allied strategy of squeezing the Central Powers from east and west simultaneously in order to wear down the enemy and prevent Germany from deploying overwhelming strength on a single front. It was one of the biggest battles on the western front to that date: 14 Allied divisions attacking along a front of 27,000 yards, after a seven-day bombardment which fired an estimated 1.5 million shells. Events elsewhere distracted the Allies and in particular, the German attack on Verdun, codenamed Operation Gericht, between February and December 1916 drained away French forces. The Somme has had a deep cultural and social impact on Britain and Ireland due to the astronomical losses suffered by the British army, most notably on the first day of the offensive. On 1 July 1916 the British army suffered 57,000 casualties and almost 20,000 of these were killed. Over the course of the five months, British losses were close to 420,000. To the modern observer, the battle has come to symbolise the futility of the First World War and many of the enduring cultural stereotypes associated with the conflict stem from the Somme: heavily-laden troops struggling through barbed wire, killed by machine guns and incompetent leadership, particularly Douglas Haig. The tendency to blame British leadership for the losses remains to this day. For instance, the Irish Independent in 2014 bracketed the battles of Ypres, the Somme and Passchendaele together as ‘the sorry tale of huge British casualties under Haig’s command for negligible gain.’ While this is true to an extent, subsequent investigations of the Somme have also found that the offensives played a role in Germany’s eventual collapse in 1918. The losses suffered by the German army on the western front in 1916, thought to be around 600,000 men, could not readily be replaced. This not only demoralised the German military but also weakened the resolve of the home front. Galway’s connection to the Somme is hard to gauge. The Connaught Rangers, notionally Galway’s own British army regiment, was present at the battle as part of the 16th Irish Division, but its other battalions were also scattered across various Allied fronts and at home during 1916. Recruitment in Connaught was never as heavy as the other provinces, although the authorities did attempt to reach out to the population, even sending Irish-speaking soldiers to the Aran Islands to drum up volunteers. In any case, the Rangers drew men from across the province and the rest of the country, meaning that Galway did not have a close military link to the battle. Certainly it does not resemble the intense and visceral relationship between a city like Belfast and the Somme, forged through the 36th Ulster Division. As John Morrissey has discovered, the Connacht Rangers does not have a strong purchase on Galway’s public consciousness when it comes to the First World War in general and the Somme in particular. Nevertheless, many Galwegians fought and died at the battle; Tomás Kenny has suggested that 1017 men from Galway fought in the Great War and that at least 755 died. Of these, perhaps 150 fell at the Somme and an unknown number were wounded. Ireland’s memorial records of the conflict show that Galwaymen killed in the summer and autumn of 1916 served both in traditional Irish units, such as the Connaught Rangers, Royal Dublin and Munster Fusiliers and the Inniskillings, but also in unexpected regiments such as the Lancashire Fusiliers, the Northumberlands and the Manchester Regiment. Other, less well-known, connections between Galway and the front also existed. The County Galway Military and Naval Society, working in association with the Irish Women’s Association, worked tirelessly to send parcels to Connaught Rangers at the front and in German POW camps. At Christmas 1916 Lady Henrietta MacDonnell of the Irish Women’s Association noted that donors in Galway had sent so many socks for the troops in France that the association had to hold some back: ‘We had some socks to send but your Co. Galway contribution was so magnificent that I have kept ours for a little later. Indeed I doubt if the P.O. at Avonmouth would accept any more packages for me. Request over 18 Cwt went off Dover transfers last Monday!’ Likewise, the Galway Express carried advertisements in July 1916 for a carnival and ‘Fancy Dress Gymkhana’ which was in aid of the Connaught Rangers and prisoners of war. Gentlemen wishing to attend had to pay five shillings; ladies were charged a more reasonable four. 200 square miles of fortified ground, including forty-four villages, have been regained, and 70,000 German prisoners have been taken, whilst the enemy’s casualties is scarcely less than four times that figure…the security of the German front in northern France is gravely menaced. Should the Germans succeed in effecting a retirement, and shortening their lines, a vast belt of territory would fall into the hands of the Allies, but there would still be further and fiercer fighting. Of course, the Tribune was not alone amongst Irish newspapers in presenting a confident picture of what was happening on the Somme. The Irish Independent on 3 July reported that the German front had been broken for sixteen miles, headlining that the Allies had ‘burst through’. In the midst of all this optimism, the price of the battle was slowly being revealed and every edition of the paper carried short notices of Galwaymen killed or wounded. For instance, in August 1916 Lt Archibald Semple, Galway native and former Irish National Volunteer officer, was reported to have returned home suffering from ‘shellshock’; in September Private Thomas O’Shaughnessy from Kinvara was said to have been wounded for the third time, while the Moore family of Portumna sadly reported in October that their son PJ had been killed. Moore, of the 6th Battalion of the Connaught Rangers, had been killed at Ginchy on 3 September. He was one of 23 officers and 407 men of the 6th Battalion of the Rangers who were listed as casualties during September 1916. Once the initial breakthrough failed to materialise, reports from the front became more and more circumspect. Rather than playing up the immediate success of the attacks, the Tribune began to highlight the long-term effect of the offensive on the course of the war. For instance, in mid-October 1916, when the battle was slowly grinding towards its conclusion, the paper acknowledged that although the ‘results are far from decisive…viewed in their proper perspective, they are extremely promising.’ The average depth the Allies armies had broken through the German lines along the front was only six miles, but the fact that the Germans had lost around 60,000 unwounded prisoners boded well. As the editor pointed out, the loss of 60,000 men would be ‘enough to decide the result of any former war’. In August, the paper mentioned the heavy casualties being suffered by the British forces, but had commented pragmatically ‘that is war’; by the following month the editor was admitting that the advances being made by the Allies were ‘won at terrible sacrifice. In to-days papers the names of over 6000 British soldiers appear in the list of dead and wounded! A fearful holocaust.’ The end of the offensive, in November 1916, passed without comment. One of the most interesting aspects of the war on Galway was the extent to which awareness of the conflict soaked into public consciousness. Surrounded on all sides by constant reminders of the war – naval vessels off the coast, recruiting centres in the city, reports in the newspapers, families in mourning, soldiers and sailors coming home on leave and the constant stream of letters and telegrams from the front – the public came to see the conflict as something that carried on in the background while they went about their daily lives. Local newspapers were an excellent example of this: regular and detailed updates on the course of the battle at the Somme were overwhelmingly surrounded within the pages of the papers by reports from local courts, community notices, GAA matches, markets, fairs and festivals. The war was absorbed into everyday life and society became subtly militarised. For example, an advertisement for a fun fair in Salthill in July 1916 took pains to point out that the carnival would include ‘great flying aeroplanes’ and a ‘magnificent military orchestral organ introducing most select and popular music.’ Neither the battle nor the war itself disrupted events such as the Ballinasloe horse fair and in August 1916, the feature race at the fair was won by a horse which was, ironically, named Irish Volunteer. In addition, at this time the newspapers were still full of details from the Rising, which had occurred only a few months before. Many Volunteers and Cumann na mBan, as well as other Galwegians, were still under arrest or interned in Britain and the papers often carried stories of releases or transfers. Reporting on family, friends or neighbours involved in the Rising arguably would have had a more immediate impact on the populace than the war, which was a constant but muted presence in the background. For example, on 1 July – the same day the Somme offensive commenced – the Galway Express carried a story concerning Professor Thomas Walsh of UCG, who had just been released from Frongoch and had returned to his home in Taylor’s Hill. Galway did not have a close connection to the battles along the Somme during the summer and autumn of 1916, in the same way as many other Irish towns and cities had. Nevertheless, a significant number of Galwegians were killed in the battle and many Galway homes were plunged into mourning by telegrams from the War Office or reports in the newspapers. Local and national newspapers kept the public informed as to the course of the offensives, although their sometimes exaggerated accounts of progress did not conform to the harsh reality at the front. Life and news in Galway would soon be dominated by increasing land agitation as well as the conscription crisis, followed by rebellion and civil war. Consequently, the Somme would not dominate public memory in Galway in the same way as it did in other places across Ireland and the UK. ’10 Men who shaped the road to war’, Irish Independent, 10 May 2014. ‘Recruiting in Aran’, Connacht Tribune, 12 February 1916. ‘Great Galway Carnival’, Galway Express, 29 July 1916. ‘Victory and Peace’, Connacht Tribune, 12 August 1916. ‘Enter Roumania – a shorter war and a speedier victory’, Connacht Tribune, 28 August 1916. ‘Allies Marked Progress’, Connacht Tribune, 9 September 1916. ‘Towards Victory’, Connacht Tribune, 30 September 1916. ‘Strong British Offensive on the Somme’, Irish Independent, 3 July 1916. ‘National Volunteer Officer Wounded’, Connacht Tribune, 19 August 1916. ‘Wounded’, Connacht Tribune, 30 September 1916. 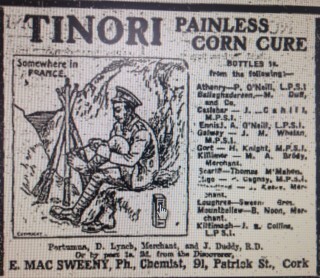 ‘Pte PJ Moore, Portumna’, Connacht Tribune, 7 October 1916. Morrissey, John. (2005) ‘A lost heritage: The Connacht Rangers and multivocal Irishness’ in McCarthy M (ed), Ireland’s Heritages: Critical Perspectives on Memory and Identity (Aldershot, 2005), p. 83. ‘War and Winter’, Connacht Tribune, 14 October 1916. Allies Marked Progress’, Connacht Tribune, 9 September 1916. ‘Tierneys Famous Irish Roundabouts’, Galway Express, 22 July 1916. ‘Excellent Days Sport’, East Galway Democrat, 19 August 1916. Galway Express, 1 July 1916. ‘Shoot Straight for the Arcade’, Connacht Tribune, 15 July 1916. 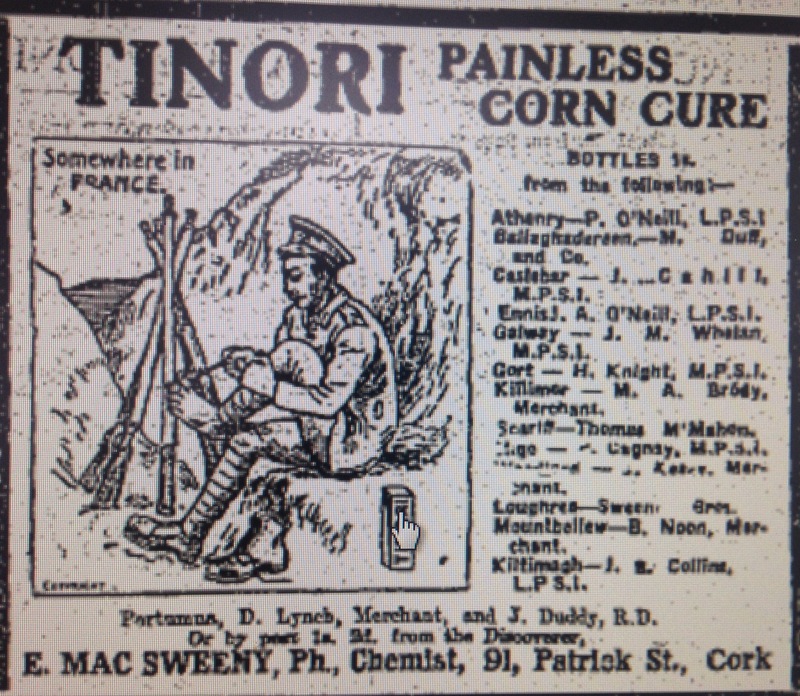 ‘Tinori: Painless Corn Cure’, Connacht Tribune, 5 August 1916. ‘Real War Economy’, Connacht Tribune, 26 August 1916. My husband, Joseph Michael Ashe was given two medals by his grandfather, Pte. Michael Ashe of the Connemara Rangers. He survived, but suffered his whole remaining years with what today is called PTSD. Do you have a list of those in Galway who fought and survived? They should also be remembered as they lived only to suffer. The best guide to Galway’s Great War dead are the books by William Henry. You will find full details for them in our Further Information and Research section above. His book Forgotten Heroes is an exhaustive list of Galway’s service men and women in WWI.